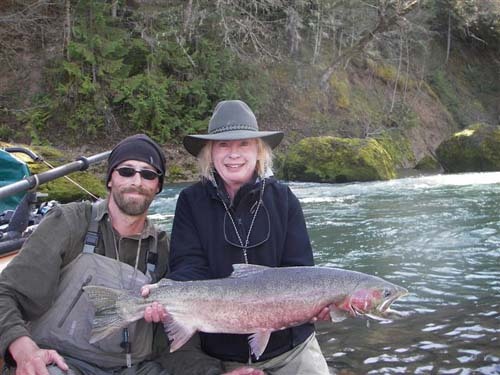 A friend from the Shasta Mayflies, Letitia Cutforth, and I went fishing with Dave Teitzel on the Umpqua for winter steelhead the weekend of March 24 and 25. 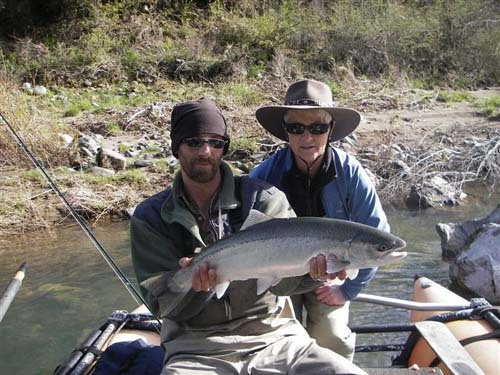 Dave had advised us that there weren't going to be many fish but there was potential for a big one and he was right. Saturday morning Letitia caught a very nice chromer. I got a 14" cutthroat that I got excited about but no one else did. You can't disrespect any trout, regardless of size. It's an offense to the Fish Karma. Weather was nice which was also a factor. 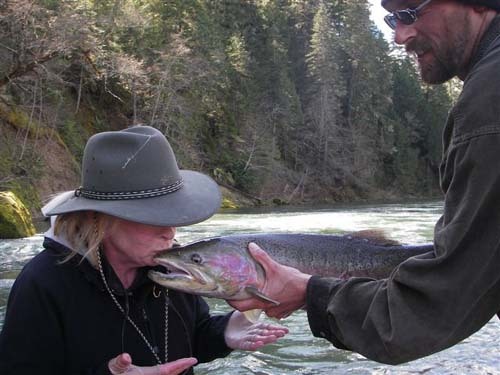 You are required to suffer for winter steelhead. Sunday, we fished in rain all morning and put in some hours of cold and misery which made the experience much more realistic. Sunday afternoon, on the last cast in the last hole where we could anchor, my fish took the fly. It was a very soft take until I set the hook the second time. Dave was tremendous help in helping me land this guy. We fought him in the original pool, down a set of rapids, and in a second pool. He (the fish, not Dave) really wanted to head back out to the Pacific. Then it was five fights to the net before we managed to get him in. We taped him at 37 1/2 inches and estimate his weight between 14 - 16 pounds. Then I flew home.